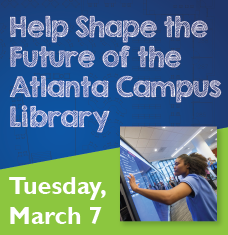 The Georgia State University Library is working with an architectural firm to imagine and plan for the GSU Library of the future. We want to hear your thoughts and ideas! Date & Time: Tuesday, March 7th, 9:00 a.m. – 1:00 p.m.
As a reminder, formal identification is required for admittance to the Library. Georgia State University students, faculty, and staff may present either a registered fingerprint or valid PantherCard. Visitors must present a state-issued ID, such as a driver’s license. This entry was posted in For Faculty, For Graduate Students, For Students, General News, Uncategorized. Bookmark the permalink.